ADELPHI, Md. (Jan. 09, 2015) -- New, lighter batteries are under development for Soldiers now, in-house, at the Army Research Laboratory here. 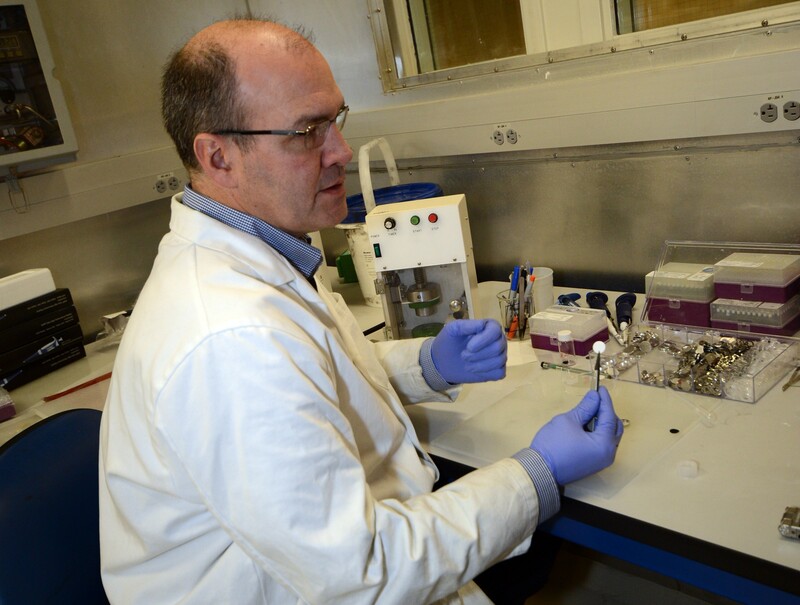 Chemists at the lab here do materials research on lithium ion batteries and other advanced battery chemistry in an effort to support the warfighter. Army chemist, Jan Allen, demonstrates how to build a "button cell," the type of battery used in a watch, at the Army Research Laboratory, Dec. 9, 2014. "We help to develop new battery materials that are lighter and last longer for the Soldier, so he doesn't have to carry so many batteries," said Cynthia Lundgren, a chemist and Chief of the Electrochemistry Branch of the Power and Energy Division in the Sensors and Electron Devices Directorate. To create a better battery, Lundgren and her team experiment with small "button cells," such as what one might find in a watch. A "cell" consists of two electrodes: an "anode," which is the side marked with a "minus" sign; and a metal oxide or phosphate cathode, which bears the "plus" sign. Between these two electrodes is a liquid electrolyte soaked separator that facilitates the transfer of lithium ions to transfer charge. One or more of these "cells" is used to construct a battery pack. The team tinkers with the different materials that make up both the cathode and the anode. They also tinker with the chemistry of the electrolyte of the battery. Lundgren said that one way to make a battery lighter is to use electrodes that increase its cell voltage. "If we could raise the voltage of a single cell -- energy density is a direct function of the voltage -- we could make the battery lighter," she said. "The problem is, as you go up in voltage, the electrode becomes much more energetic, and so it reacts with the electrolyte." The reaction of electrodes with the electrolyte is one of the key problems Lundgren and her team have proven successful at tackling. "The electrodes are very corrosive, and they react with the electrolytes," said Von Cresce, a chemist at the lab. "So what ends up happening as you cycle the battery back and forth is that the electrolytes are degraded by the cathode because of the voltage of the cathode." For the types of rechargeable batteries that Lundgren and her team are developing, that degradation means fewer charge/discharge cycles. Additionally, as the cells are charged and discharged, they retain less of their ability to hold a charge. To prevent such degradation in a cell, the team created a solution called HFiPP -- short for "tris (hexafluoroisopropyl) phosphate," which they use to enhance the electrolyte to make it more stable in high-voltage situations. "It's a corrosion inhibitor," Lundgren said. "You just add it to the electrolyte that any manufacturer would put in. It's a little bit of pixie dust." In the lab at Adelphi, the team is experimenting with a higher voltage iron-doped lithium cobalt phosphate cathode developed in the lab by fellow Army chemist, Jan Allen. Cresce said the LiCoPO4 cathode is particularly high voltage, at 4.9V. "It seems to be more reactive towards the liquid electrolyte," he said. "This is a common problem among many varieties of experimental high voltage cathodes. It really seems to behave badly against unprotected liquid electrolyte." But with the HFiPP solution added to the electrolyte for corrosion protection, the team was able to develop a battery that has both a higher voltage cathode, but at the same time is more stable. It can be charged and recharged many times, while maintaining its capacity and not corroding. In early 2015, the lab expects to get back from a commercial manufacturer samples of larger cells, called "pouch cells," that were built using the same chemistry they developed in their lab. They and other Army researchers will evaluate those cells for their performance and safety characteristics. "We'll go through a number of evaluations," Lundgren said. "Do they perform as a pouch cell the same way they perform as a coin cell? One of the things you can't see in a coin cell is gassing. So if there is some reaction between the electrolyte and the electrode, and if you can get gassing you can make the pouch cell blow up." Lundgren said she believes what they have developed at the Army Research Lab will make batteries lighter and last longer -- something the Army wants in order to better equip Soldiers.